Researchers at the US Army Aberdeen Proving Ground Research Laboratory have discovered a new high-strength aluminum alloy which could prove to be pertinent to the future of hydrogen fuel becoming a viable option. When testing the alloy, researchers found pouring water over its surface created a bubbling reaction and produced hydrogen gas. Of course, this reaction is extremely unique because in general, aluminum exposed to water oxidizes. Since the new high-strength aluminum alloy keeps exuding hydrogen when it comes into contact with water, it represents the potential for a portable and affordable source of hydrogen for fuel cells and various other energy applications. 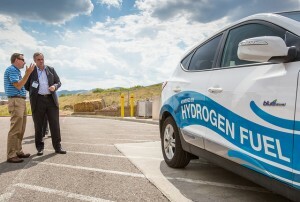 The idea of utilizing hydrogen fuel has been thoroughly explored but up until now, the notion it could actually become a viable energy source has been an issue. That is until now, as producing hydrogen on demand by way of a reaction with water is a true game changer. If you have water and aluminum, then boom! You have the ability to produce hydrogen fuel in a sustainable way. Not too mention, the new method discovered by the researchers is extremely efficient, to the tune of being able to produce hydrogen fuel in less than three minutes at nearly 100 percent efficiency. Coupled with the fact that inexpensive, scrap aluminum can be utilized for the process, and we have a potential breakthrough on our hands when it comes to the future of hydrogen fuel and its viability.